Based on the family slogan "There are no great tricks to hand-made,"
The brewery is in a natural location surrounded by mountain groves, isn't it? brewing sake: Mr. Tetsuya Tajika. Northwest of Banshu Field, Okuharima's land is a verdant place, surrounded by a grain-growing region. With the clear air and groundwater from the pure mountains, fields, and rivers, and the high-quality locally grown Yamadanishiki and Hyogoyumenishiki sake rices, there is a rich environment for sake brewing laid out. Now, with only rice, malted rice, and water, we hand-make our natural pure rice sake the way it should be made. We add absolutely no brewing alcohol, sugar, or fragrances. The third-generation household head, Kuro Shimomura lives by the family motto, "There are no great tricks to hand-made," but living in this natural environment you become a natural stickler for "hand-made." 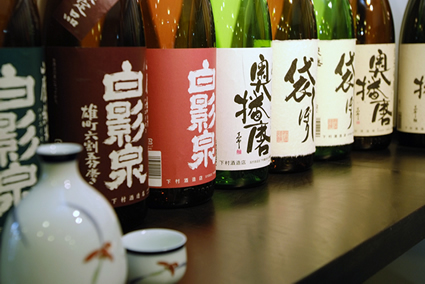 Since our sake is brewed from natural ingredients, the alcohol is gentle to the body as well. You feel refreshed the day after drinking it, too! What are the unique features of hand-made sake brewing? Mr. Ouga runs a fund supported by fans of Japanese sake. 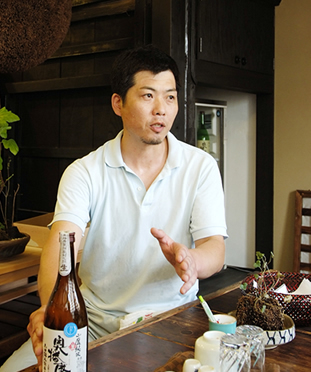 Furthermore, he aims to raise the level of brewing Japanese sake. There are basically two brewing techniques. They are the "unfiltered method" and the "bottle storage method." With most sake making, at the final step impure flavors and other unnecessary elements are removed by a filter to fix the flavor, but since we use only excellent quality natural ingredients, there are no impure flavors and filtration is unnecessary. The natural ingredients create the whole pure sake flavor, don't they? 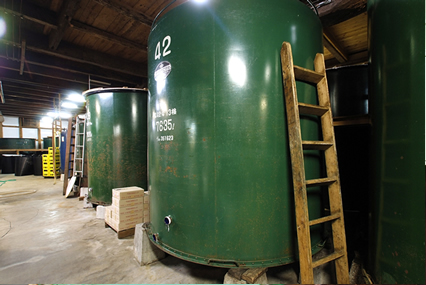 With the storage method, the suitable temperature depends upon the type of sake being made. It must be poured gently into the bottle little by little, so no tanks are used. With sakes that take a long time to mature, it must be stored for 3 to 5 years, so it takes a lot of storage area, but for our ideal taste, this is a necessary process. We will not sacrifice quality for efficiency, so we cherish the inefficiency for quality. Tell me the representative brand of your sake. where you can experience the different tastes.I hope to find a brand I like. Okuharima is our representative brand. Using Yamadanishiki and Hyogoyumenishiki rice, with differing ingredients and production methods, there are about 22 or 23 varieties. Each has its own aroma, taste, sharpness, etc. They are all products we are proud of that are suited to different meals and situations. We hope you will drink your fill of this great depth of sake. Some customers tell us that after drinking our sake, their image of sake changes. We hope that people who don't usually like sake will drink ours and find a taste for it. Our brewers strive to fill our bottles with sake that doesn't just taste good, but moves you as well. The formation of the "Okuharima Fund" is a new approach, isn't it? Barrels are stacked up on top of each other. This provides a brewery-esque atmosphere. The scenery makes me start to anticipate drinking delicious sake. It is a sake fund that has recently been gaining attention. About 20 breweries in Japan have formed it, but our company founded it in 2008. It is run with one contribution being ￥50,000. We distribute some high-priced sakes to contributors, but there is no guarantee of a return on their investment. There are many cases where "sake fans" invest. It is a show of encouragement that they understand and support our sake brewing. By forming the fund, we became able to directly and widely hear the voices of our end users, and our will to respond to their expectations has grown stronger. 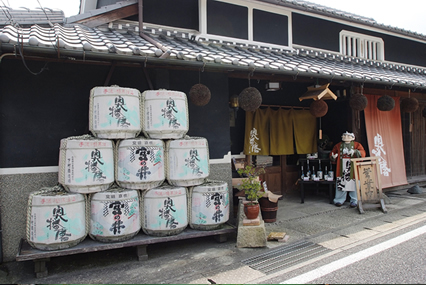 Many customers come to buy our sake at our direct store, but thanks to the fund I feel we are able to connect with customers across Japan. The title on our business cards is "manufacturing department" but we divide up and are in charge of about 120 clients across Japan, so we do sales as well. Since brewing and sales are both handled by the same people, we are able to directly feel the needs of the market and communicate our ideas directly. So, in the summer when there is no brewing going on, we fly all around Japan. Our customers' feedback is often a hint for new product development. It is a small brewery, but with a wide field of view, you certainly have conviction with your sake brewing, don't you?